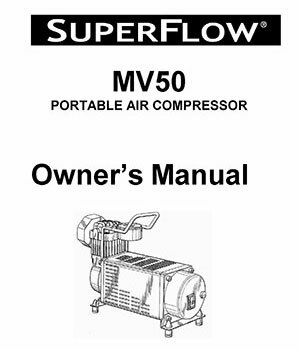 I have owned a Q-Industries MV50 SuperFlow Hi-Volume 12V Air Compressor for many years now and highly recommend it for its performance and value. I used to leave it at home and only take it along in its carry bag on long trips, to be able to repair a flat with my Safety Seal Tire Repair Kit #SSKOTR, or on trail outings to be able to air down then back up conveniently. 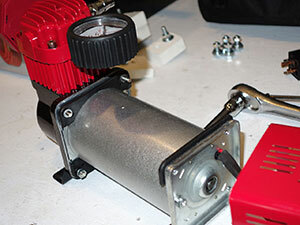 I now have a large shop compressor and don't use the MV50 while at home anymore. 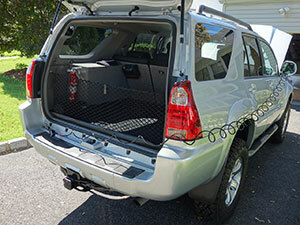 I like the benefits that carrying an air compressor in the vehicle provides, but don't like it taking up sapce in the cargo area, nor the set-up invloved each time I need to use it. 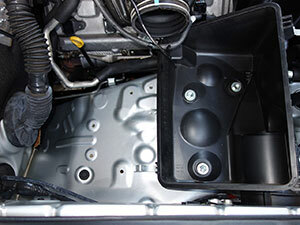 So I decide to permenantly mount the air compressor on board the vehicle, out of the way in the engine compartment area. 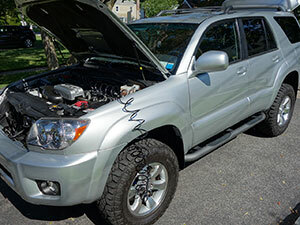 I hardwired it direct to the 4Runner's battery eliminating the battery clips. Also I have re-wired the compressor to eliminate the small gauge wire and cheap electronic components and help it get the power it needs to run most efficiently. 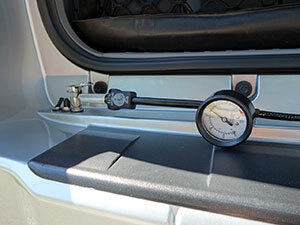 The SuperFlow MV-50 portable tire inflation system is designed for inflating 4X4, truck, SUV, and RV tires. 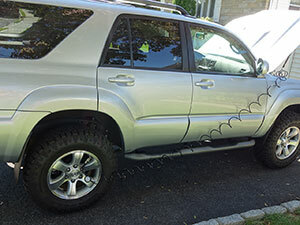 Perfect for airing up when you come off the trail. 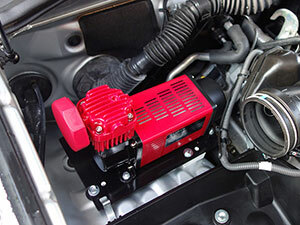 The MV-50 air compressor is a rugged direct drive 12-volt, 30 amp air compressor with an outstanding 2.54cfm of air flow. 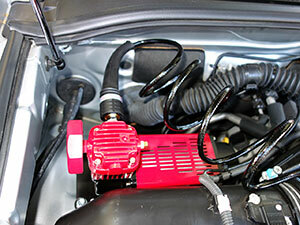 Powers directly from your 12-volt battery by a 10 foot heavy duty power cord and alligator clips. 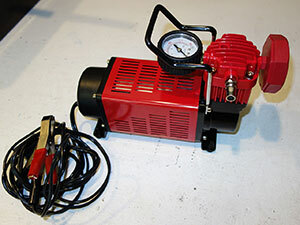 Included is a 16 foot self-coiling air hose with quick connect air fitting and brass inflator. 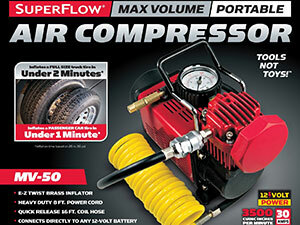 Compressor, hose, and accessories neatly pack into a durable nylon carry bag. 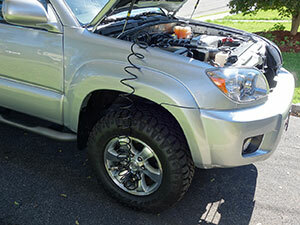 The duty cycle for this compressor is 40 minutes on, 20 minutes off which is more than enough time to air up all four tires when you come off the trails. 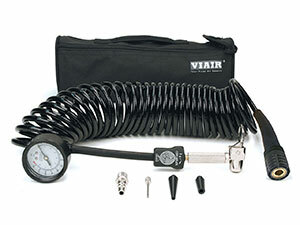 Air Hose Length: 16 ft.
Dimensions: 9.01" x 11.22" x 7.87"
The MV50 compressor's factory wiring is its weak link. I have rewired nearly all of it before installing and hardwiring it in the vehicle. 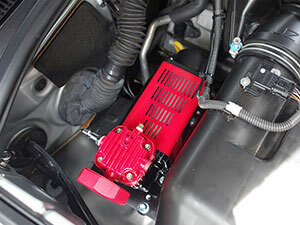 This is to allow the wires to run cooler and draw power more efficiently. 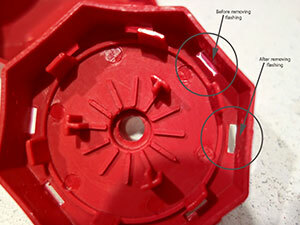 Opening the plastic end cap will reveal the switch, relay, incoming wiring from the battery clips and outgoing wires to the compressor motor. You will find 14 gauge wires are used for the 10 ft. Power Cord with Battery Clips. 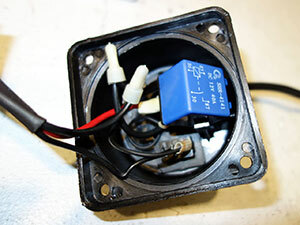 Smaller wire gauge was used on the relay contacts. The wires are all direct soldered and do not use automotive crimp connectors. The connections look weak at best. 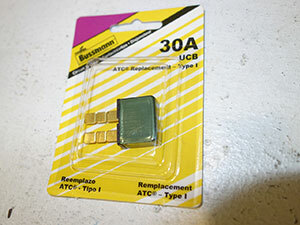 There is also an inline 30 amp automotive fuse in a sealed holder. There is also a built in Overheating Protection Circuit which I did not touch. This is not in the end cap but rather closer to the motor. In the event the unit reaches an unsafe operating temperature, a protection circuit will cut power to prevent damage to the unit. 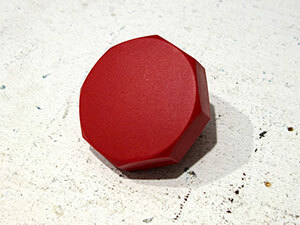 If the protection circuit activates, immediately disconnect power from and allow it to cool. The unit will cool in approximately 15 minutes, depending on environmental conditions. The protection circuit will automatically reset itself when the temperature returns to a safe operating level. 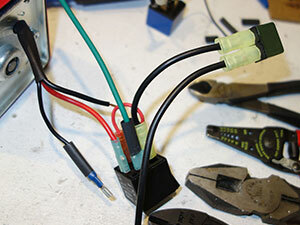 I replaced the main power wire from the battery with a stranded 10 gauge wire with thicker insulation. This eliminated the inline fuse which was replaced with a Bussman Type 1 30 amp ATC Auto Reset Circuit Breaker #BP/UCB-30-mounted inside end cap. 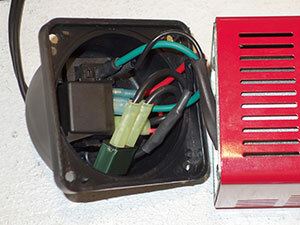 Eliminating the inline fuse and holder provides a cleaner more professional look and avoids the need to change the fuse if you overload the compressor. 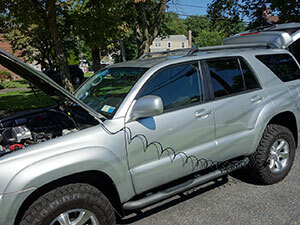 Overloading the compressor can happen if you connect the hose to the tire first before starting up the compressor. The internal relay was replaced a heavy duty RadioShack 12V 40A SPST Automotive Relay #2750001 using solderless crimp type quick disconnects. All connectors were covered with heat shrink tubing and all connections made with 14ga wire. The ground wire was also changed to 10 gauge stranded wire and shortened considerably to run to a nearby ground source rather than a longer run back to the battery. All bolts were tightened up and the rubber feet were replaced with rubber grommets to dampen vibration when bolted to the mounting bracket. 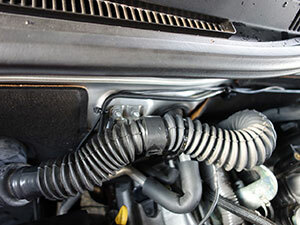 The factory air filter on the Superflow needed to have the intake holes cleaned up by removing the plastic flashing around each one. A razor blade and ignition file did a good job of removing the flashing left over from manufacturing and enlarged the holes a bit as well. 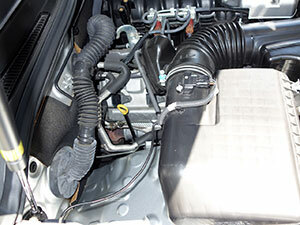 There is ample space in the 4th Generation (2003-2009) Toyota 4Runner (V8 model pictured) to mount the MV50 air compressor in the engine compartment right behind the intake air box. 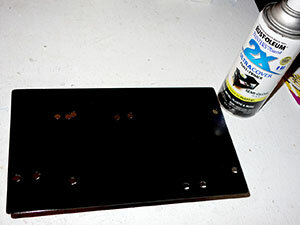 To make a solid level mounting surface I used a 16ga piece of sheet metal purchased at the local Home Depot. 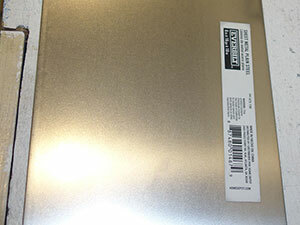 A 6" wide by 10" long piece is needed, cut to size using a jig saw with metal cutting blade installed. 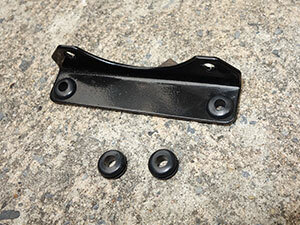 4 holes were drilled in the vehicle and a corresponding 4 in the mounting bracket. 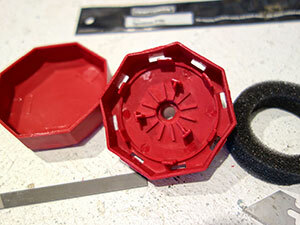 4 more holes were drilled in the bracket to mount the air compressor. Again, rubber grommets were used in the compressor base brackets to isolate vibration noise between compressor and mounting bracket. The mounting bracket was shimmed as needed to level it by using scrap white PVC lumber I had on hand. 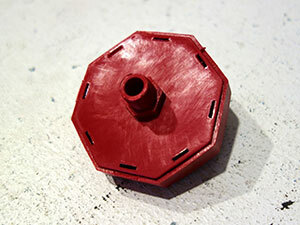 The air compressor mounting bracket was painted black to resist rust. I have had this compressor for a number of years now. 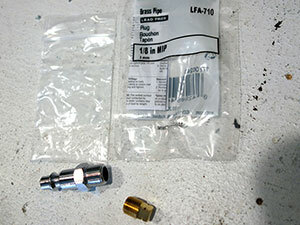 Newer ones now come with a standard air hose fitting. 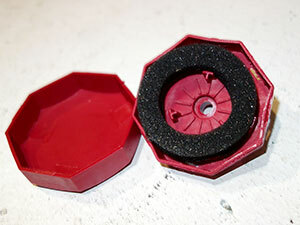 Mine came with a proprietary version that only works with their air hose. I ordered a Type 'M' (Milton/Industrial) #AF-M direclty from Q-Industries which fit their metric sized threads (rather than standard NPT type threads) in the compressor head perfectly. While at it I removed the inacurate air pressure gauge and filled the hole with Watts LF-710 1/8" Brass Square Head Pipe Plug MIP. 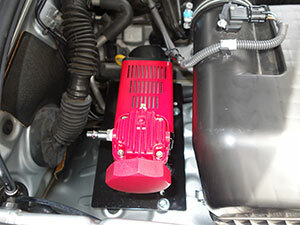 You won't be able to see the gauge now that the unit is mounted in the engine compartment anyhow and removing it and the handle gives a cleaner look. The longer, and higher quality, hose I purchased has a built in pressure gauge already. 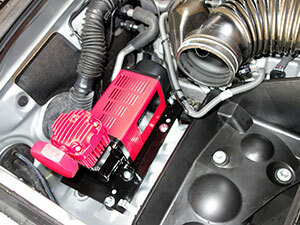 Here are some pics of the finished air compressor mounted in the engine compartment. 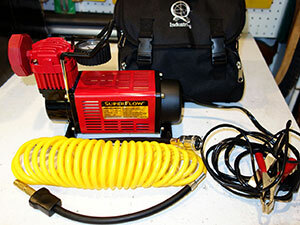 Also purchased to use with this air compressor is a longer higher quality air hose. I went with the Viair #00027 which is 25' long. 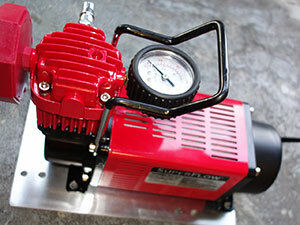 It is a strong braided type hose with built in 0-60psi air pressure gauge. 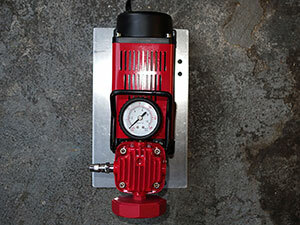 It also has a built in 5-in-1 Inflator/Deflator. 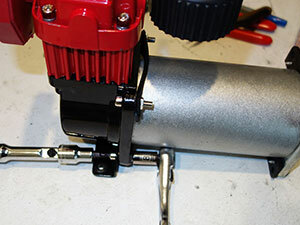 I would have preferred a straight chuck rather than right angle, otherwise I am very satisfied with this air hose. Intermittent Deflation. Push the deflator collar down to deflate, release to stop deflation.